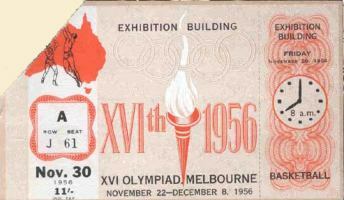 Tickets were sold for individual sessions when more than one session took place each day, except in the case of events held at the Main Stadium (Opening Ceremony, Athletics, Hockey Semi-finals and Final, Football Semi-finals and Final, and Closing Ceremony), and for Shooting at Williamstown and Laverton, and Rowing and Canoeing at Ballarat. In these cases admission was for the day. Tickets were printed in fifteen two-colour combinations, based on four basic colour backgrounds and seven overprints. This provided one colour for each day of the Games. 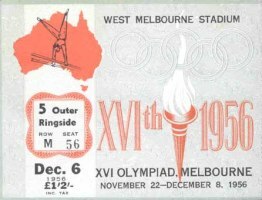 The emblem of the sport being held, together with name of stadium, seat number, date, price, and clock faces showing times of commencement were shown on the face of the ticket, whilst on the reverse side was shown a plan of the particular stadium indicating the position of the seat. Design and printing provided a reasonable measure of security against forgery of the ticket. 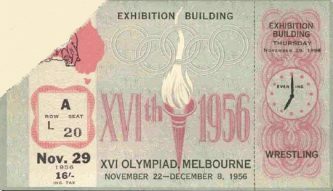 Printing of the tickets was carried out in the security section of the Victorian Government Printing Office. Printing commenced in January, 1955. Altogether, including bulk stock tickets for emergency purposes, 2,580,000 were printed and 1,341,483 were sold. 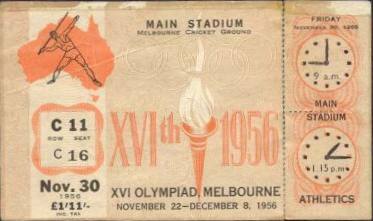 Ticket sales overseas were not very extensive, approximately 110,000 only being sold. Of these about 56,000 went to New Zealand and the Pacific Islands, 22,000 to U.S.A. and Canada and 18,000 to the United Kingdom. Some 14,000 were spread over the rest of the world. Tickets in small groups were sold to people in some 60 overseas countries. Sales within Australia on the other hand were satisfactory. There were capacity attendances at the Main Stadium for the Opening Ceremony, Athletics, and the Closing Ceremony, also at Swimming, Gymnastics, Cycling, and Fencing. Sales for other sports were reasonable except in the cases of Canoeing, Shooting, and Modern Pentathlon, where they were poor. There was no enclosure for Yachting and no sale of tickets. Arrangements were made during 1954 whereby the whole of the banks established in Australia, together with the internal and external airlines connected with Australian tourist trade, and the shipping company carrying passengers between Australia and New Zealand, made available their offices and staffs to provide booking agencies on an honorary basis. These agencies successfully carried through an important national work in arranging the sale of tickets overseas and in other States of the Commonwealth of Australia. Two important international tourist agencies also handled overseas ticket sales, but on a commission basis. Requisitions for tickets received through these agencies were finalized in the Organizing Committee's central booking office. The box office for over-the-counter sales in the City of Melbourne was established at the Myer Emporium, the largest store in Melbourne, where some 4,000 square feet of floor space was set aside to handle the early rush for tickets. Sub-agencies of Myers were opened in other Australian capital cities for over-the-counter sales also. 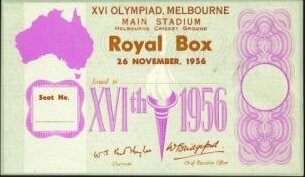 Bulk stocks of tickets were held partly in strongrooms at the Myer box office and partly in the strongrooms of the Australia and New Zealand Bank, the Committee's bankers. 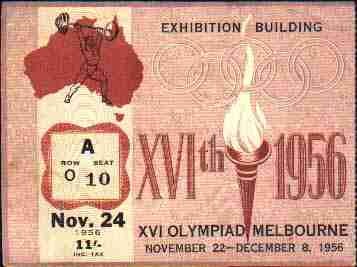 Because tickets were supplied only on requisition, covered by cash, or on over-the-counter sales, there was no difficulty, as in past Olympics, over the return at the last moment of large batches of unused tickets from overseas countries. Nor were there any bad debts arising from agency sales. The gross value of sales of tickets for the Games was £1,205,415 1s. 4d. In addition a small charge was made for entrance to training sessions, particularly of swimming, and receipts under this heading amounted to £26,558.